Information software company Localz, which assists companies with last mile delivery services, has commissioned a report on what we can expect from the utilities sector in 2019, partnering with British Gas, Citizens Advice, The Water Report and TWENTY65. In 2018 we have seen a shift within the utilities community. There has been a definitive shift from talking about customer experience improvements to realising it is something that must be delivered now. Utility companies know they are not exempt from the impact of the demands of the Individual Economy – ‘IConomy’. Can retailers survive Christmas without click and collect? In 2017, IMRG discovered that those retailers offering click and collect during the Christmas period saw a significant uplift in their sales, where those who did not faltered. Year-on-year growth for the Monday before Christmas (sometimes described as ‘Panic Monday’) was 27.7% for those offering next-day click and collect, and 17% for those offering non-next-day. In 2018 we have seen a shift within the utilities community. There has been a definitive shift from talking about customer experience improvements to realising it is something that must be delivered now. Utility companies know they are not exempt from the impact of the demands of the Individual Economy – ‘IConomy ’. Logistics and data: it’s a match! At a recent logistics roundtable discussion, Louise Robertson from Australian last-mile solutions provider Localz declared that tech in the logistics industry’s should be more like Tinder. Logistics & Materials Handling finds out why. Research conducted by market research and data company YouGov explored the public’s concerns about the current state of last-mile delivery, highlighting the stresses and concerns consumers have as a result of online delivery and on-site utility services. 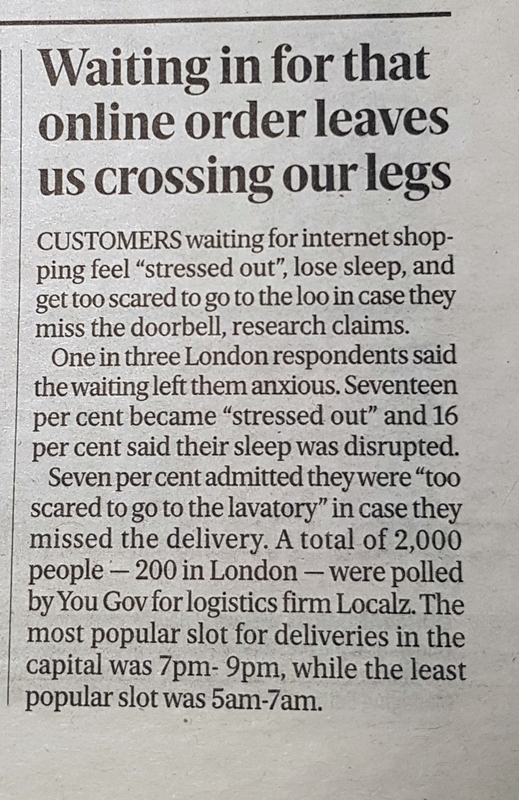 Shockingly, nearly 1 in 10 consumers are too scared to use the toilet when waiting for a delivery, for fear of missing it. When Black Friday became melded into the public consciousness in the UK in 2014 (it had been around for years before that, but 2014 was the year it exploded), many retailers experienced an upturn. Even some of those who didn’t participate in discounting saw a sharp spike in their sales owing to the general purchasing frenzy which seized the nation. A Localz research conducted by YouGov, which resulted in the 2018 ICurve Report, has explored the concerns of the United Kingdom’s consumer on the current state of last-mile delivery of goods and services. The research highlights the stresses and concerns consumers have as a result of online deliveries. Domino’s Pizza Enterprises is not like any fast food chain out there. Perhaps it’s because it doesn’t even refer to itself as one – but rather as a technology company. Its unique position in the market has come after years of embracing new and innovative ways to enhance the digital experience for its customers – with the ultimate goal of getting its pizzas delivered faster. Australian digital logistics firm Localz will push into the US next year after building a solid offshore market for its products in the UK where the company leveraged a win from an incubator competition into a European channel. Ensuring a seamless delivery process is the key to attracting consumers, new research says, while a suite of new tech platforms are helping retailers optimise their deliveries. A quick and transparent delivery process is an integral part of customer loyalty and repeat purchases, according to new research. Customers waiting for internet shopping feel “stressed out”, lose sleep, and get too scared to go to the loo in case they miss the doorbell, research claims. YouGov research shows 71% of UK consumers experience emotional and physical pressure due to last-mile delivery practices. Localz, the IConomy fulfillment leader, today announced findings from the inaugural 2018 ICurve Report. Hosted by the Postal Innovation Platform (PIP) – an initiative tasked with driving innovation in the postal ecosystem – PostalPitch asks startups to submit their latest ideas, products and solutions for consideration by a panel of industry experts, which this year includes Deutsche Post DHL, Liban Post and Swiss Post, among others. Australia and New Zealand may be far away from the U.S. and Europe geographically, but SaaS in Oceania is as interesting and is as flourishing. This is due both to the increased uptake of Saas in companies but also because some of the companies born in Oceania are raised as global contenders. Struggling in the Last Mile: Irrational Consumer Demands! Consumers are used to getting what they want and increasing demands make (online) retailers, fulfilment service providers and logistic companies go crazy, requiring a continuous focus on innovation. Yet, with the extreme fast delivery methods provided by Amazon, that is not all the last mile requests. The march of Click & Collect continues unabated. Retailers offering a lousy in-store collection experience will find they are harshly judged by customers. When carried out effectively, in-store collection results in spontaneous purchases and increased revenue. It was during the dot-com bubble craze of 1999 when Barron’s did a skeptical cover story titled “Amazon Dot Bomb”. The story suggested a possible plummet of Amazon.com fortunes as wide speculations over the dot-com market had given rise to an economic bubble which was a nudge away from imploding. While same-day delivery is still important to retailers and consumers — it ranked second on the list of priorities in the report — Andrew said that as a member of the logistics industry, he was surprised that full visibility is considered so critical. Retailers are more interested in full supply chain visibility and precision rather than same-day delivery operations, according to a report released by last mile solutions provider Localz and eft Supply Chain and Logistics Business Intelligence, a networking agency for supply chain business leaders. Guest blog: 5 Reasons why iBeacon projects fail. Beacons and proximity marketing for retail: The why,how,when, who and what. Op-Ed: Beacons and Beyond – Where to from Here? 12 months after launch: how have John Lewis’ geo-location experiments with JLab winner Localz shaped up? Guest Blog : Can location technology provide the experience shoppers expect? Localz a Finalist to Win a Sainsbury’s director as an advisor.